I walked by this Puppet every time I entered the Met and always meant to draw and paint him for my sketchbook. When I finished the drawing he looked lonely, so I added the mask and female figure to the same page, and painted all 3 of them at home. 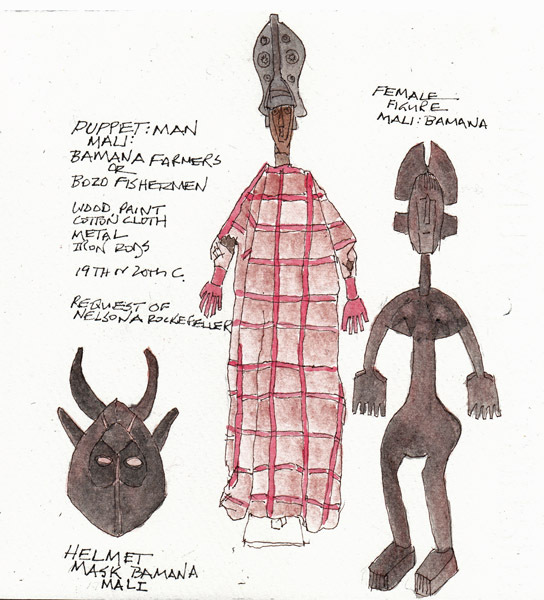 The puppet was used in ceremonial events, and is from the 19-20th C, either the Bamana farmers or Bozo fisherman from Mali. The other two pieces are also from Mali and were donated by Nelson D. Rockefeller to the Met. 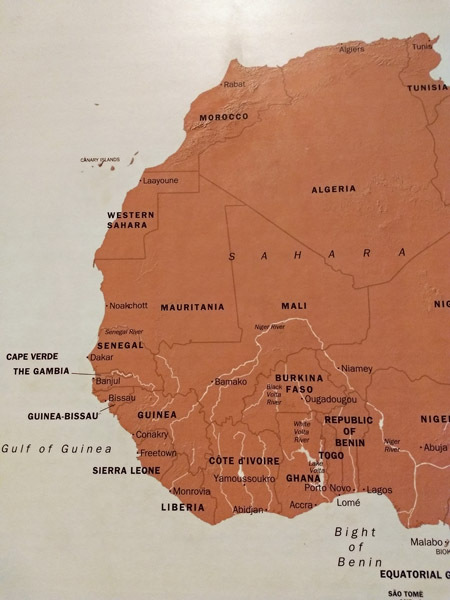 Mali is in sub-Saharan Africa, and I had to search the map to find it. I just registered for Spring Semester at Fashion Institute of Technology (FIT). Seniors register for remaining openings in classes at reduced rates, and of my possible choices, I selected Comic Book Illustration. This is way out of my comfort zone, but I believe our brains constantly need to learn new information, and each one of these experiences has some effect on my drawing and painting. 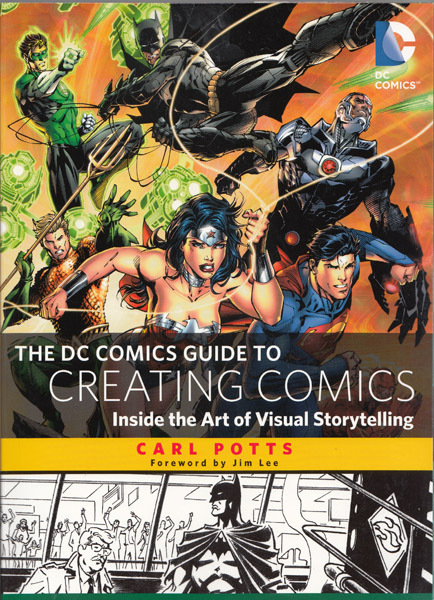 This is our class textbook, and it is image-rich. So the reading is not difficult, and hopefully will amplify material learned in class. Over the weekend I gathered all of my drawings/paintings of my imaginary characters Axel and Alice, and I am excited about the possibility of creating a comic about them for my grandchildren. 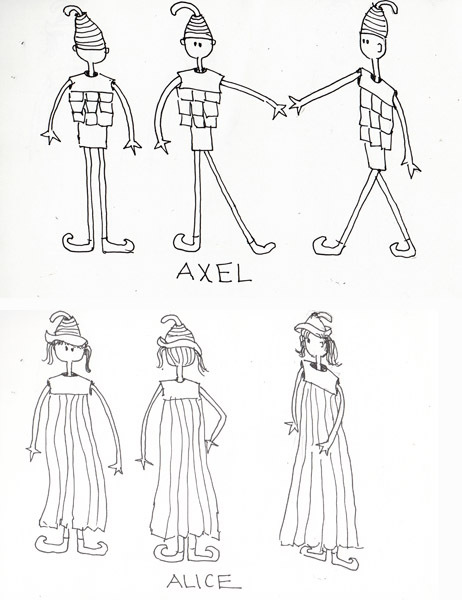 They all know Axel well, and readers of this blog may know that Axel was born from a homework assignment by Fabio Consoli in the Sketchbook Skool class called Stretching. The top painting is my homework from that class in 2015. The bottom painting is my final project in my FIT Watercolor Comps Illustration class in the 2017 Spring Semester. My grandson Zach was part of the development of the top painting. 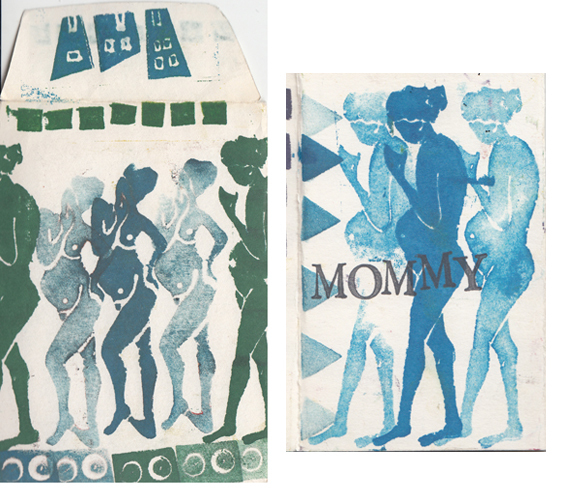 When he was 5 he drew the figure on the right, and I cut it out and collaged it to my sketchbook page - as an exercise to use child art as inspiration for my drawings and paintings. Weeks later Zach and I discussed the back story, and he said that Axel (and Alice) were from the Moon, and Axel's head shape was determined by the phase of the moon when he was born. He and Alice were playing in his mother's one- person space ship, and pushed the wrong buttons, and crashed on Earth. In class last night, we had to develop "turnarounds" for our characters - i.e. front, back, and side views. I had to name the other two characters - and one will be Boing, because of his method of locomotion, and the other will be Scarey, because right from the beginning this character seemed to set a different atmosphere to my original painting. 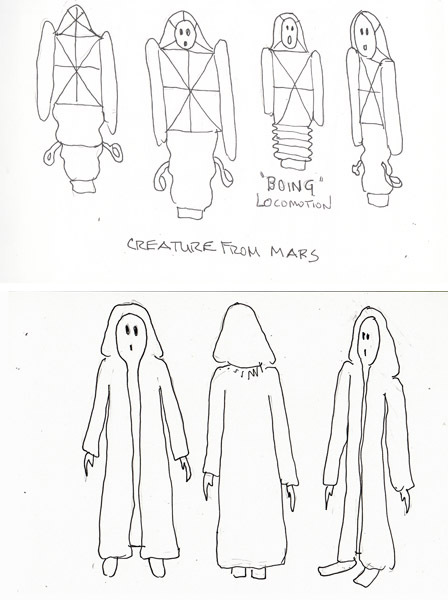 Here are Axel, Alice, Boing and Scarey "turnarounds." Not long after I retired and began to keep a pen-ink-watercolor sketchbook, I began making my own sketchbooks with 140 lb watercolor paper. At first I used commercial bookcloth, and then I realized that fabric I dyed for quilting, could also be used as bookcloth. 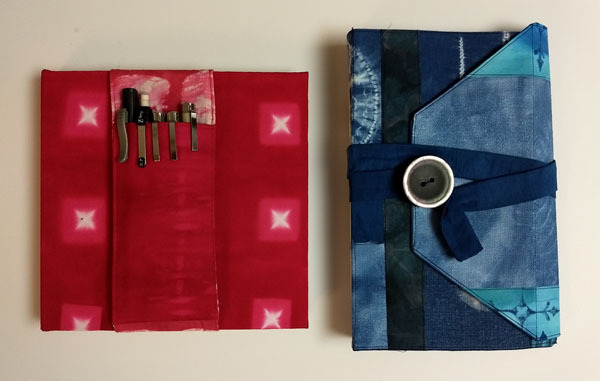 The red book on the left was made with fabric that was folded and clamped before dying-which is a form of itajime shibori. 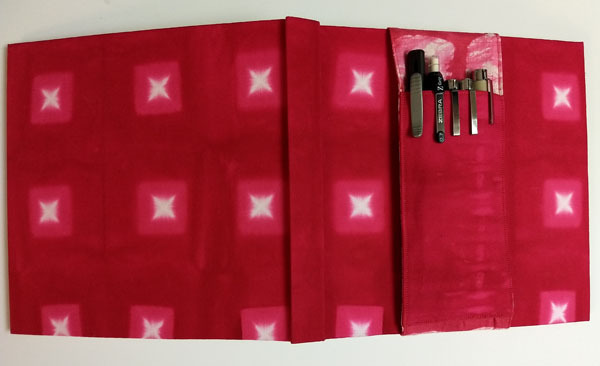 The pen pocket was made with a small amount of fabric made with the same dyes. The book on the right is called a "Remains of the Day" book, and it is the 8th annual one I made after taking an online class from Mary Ann Moss. I make these with scraps of fabric I've dyed, and random paper from magazines and books as pages. This red book has 6 signatures, each with two folios of watercolor paper, which gives 48 pages. The pen pocket, which is closed inside the front cover with Velcro, makes it very easy to just grab it and go drawing. 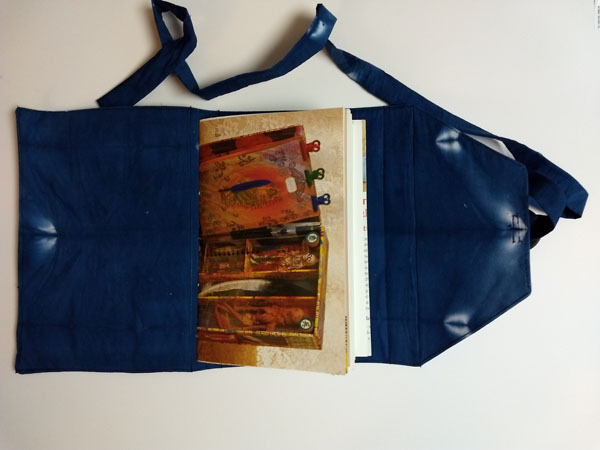 The wraparound cover of this blue book is made by creating a fabric bag, with scraps on one side, and a lining on the other. A piece of poster board is slipped inside and then the end stitched closed. 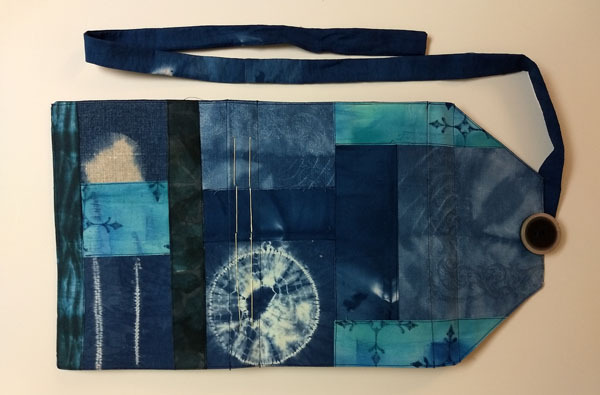 These fabrics are scraps dyed with either procion MX dye or native indigo, and the white areas on the bottom section are actually designed by stitching the designs before dying the fabric with indigo. It has 2 signatures, each with 11 folios, that are stitched onto the spine with a 5 hole pamphlet stitch. During the year I use it as a scrapbook for all of my art adventures here in NYC. I am recycling paper and I usually cover up most of each page with ephemera, photos, and drawings. This photo shows the lining and the front of the first signature. I will use this as a title page and add contact information etc in case it gets lost. By the end of the year the pages will also include envelopes, flaps, and overlapping photos. Dance is my one lifelong physical activity, and loving to take ballet class also means loving to watch ballet. 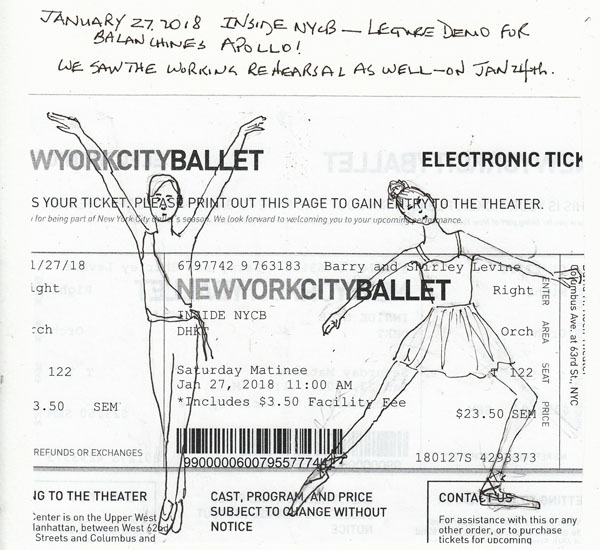 For the last 3 years my husband and I go to working rehearsals, orchestra rehearsals, lecture demos, and occasional dress rehearsals of the New York City Ballet. 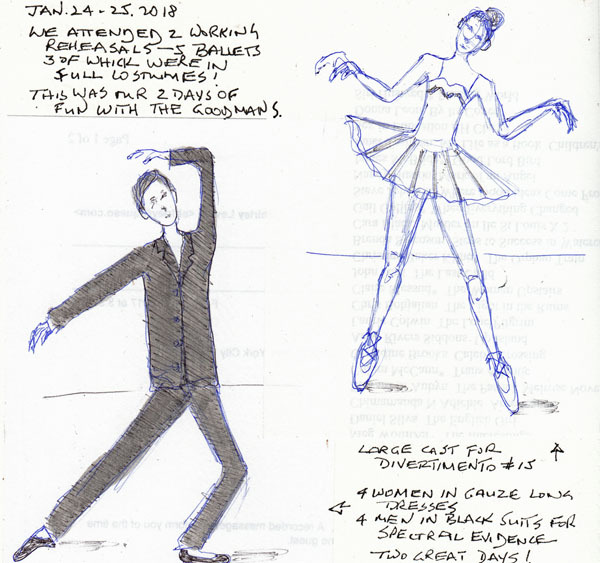 Last week we went 3 days - and these are the 2 sketchbook pages that I created from scribbles before the lights went down. The dancers move so fast that is almost impossible to capture their movements, but I try to remember at least one pose at a time. Yesterday I posted information about Master Drawings Week in NYC - with a link to the website and a map of the participating galleries. I went to see the large exhibit of drawings at Sothebys - which are being previewed until 5PM Tuesday - and sketched in pencil a favorite Goya pen and ink drawing. When Sothebys invited artists to come sketch Saturday and Sunday they stipulated pencil only. 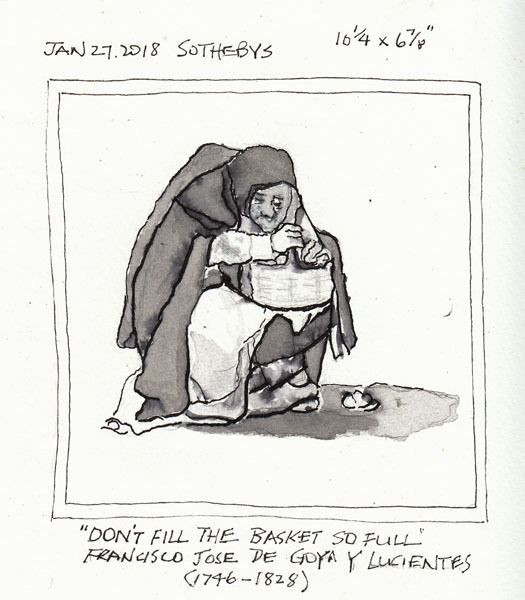 This morning I used my favorite Brause steno nib and India ink, followed by diluted ink applied with a brush to finish "my Goya basket lady." In yesterday's blog post, where I posted the original Goya drawing, I also mentioned that the estimated auction price is 1-1.5 million dollars!